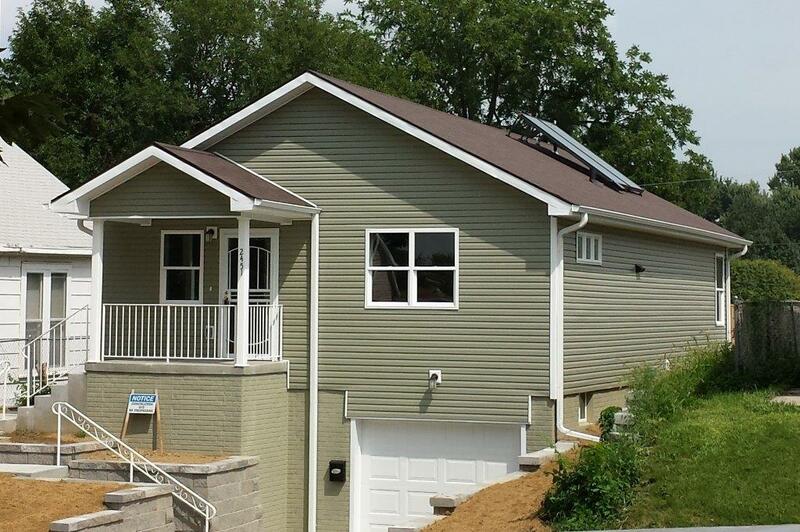 About the photograph: Nebraskans for Solar & Habitat for Humanity of Omaha installed this solar hot water system (equivalent to a 3-kW photovoltaic system or 12 solar panels) on a South Omaha Habitat for Humanity home in August 2014, one of four demonstration houses in our Solar for Low-Income Families Program. We developed our Solar Trainee & Mentorship Program from it. Habitat for Humanity of Omaha and Nebraskans for Solar partnered in an effort to bring the first solar installations to low income housing in the area. The two organizations realized a potential to join forces and advocate for cleaner energy systems in residential housing and ultimately save Habitat homeowners money. Habitat for Humanity Omaha offers no interest mortgage loans to qualifying families looking to purchase their fully renovated or new homes. The families selected for the program then partner with Habitat Omaha, agreeing to complete up to 350 hours of “Sweat Equity,” working side by side with Habitat Omaha staff and volunteers to help build their own as well as their neighbors’ homes. The homes are then purchased for full market assessed value and the neighborhood is transformed. The homes themselves are held to a high standard of quality construction and building materials. They are built to very stringent Energy Star 3.0 standards, using only high efficiency appliances, windows and premium insulation practices so that the homes operate as economically as possible. It made sense to go even further and consider solar a viable option to improve the efficiency of the homes. Solar hot water systems were installed on the first two homes selected, based on solar exposure of the lots and the timing in Habitat Omaha’s construction schedule. The neighboring homes are located in one of the organization’s target neighborhoods of north Omaha, and now sit completed amongst an ever-improving area of the city. The system is composed of south-facing solar collectors on the roof and an eighty gallon insulated storage tank plumbed ahead of the homes traditional electric water heater. The system will supply the families with 70% of their needed hot water supply and save them an estimated $500 annually. The money saved can be used to buy food, clothing, and educational opportunities for their children, items that sometimes are a secondary thought in extremely tight budgets. Habitat for Humanity of Omaha and Nebraskans for Solar are currently working on two additional solar hot water systems, one recently completed in south Omaha, and one in the Benson neighborhood, set for installation in late fall. The partnership so far has proven a successful one and has brought to light the possibilities of solar power in low-income neighborhoods. Blake Johnson is Construction Warranty Supervisor for Habitat for Humanity of Omaha, serving for four years with the nonprofit organization. He has over 10 years experience in home and landscape construction and construction management. His passions include working to build quality affordable housing to help end the cycle of poverty, and green, sustainable initiatives to protect our planet. He serves on the Board of Directors of Nebraskans for Solar. This entry was posted in Community Partners, Nebraska / Midwest News, NewsBlog, Solar for Lower-Income Households and tagged Habitat for Humanity of Omaha, Nebraska Solar Trainee & Mentorship Program, Nebraskans for Solar, Solar Power for Habitat for Humanity Houses on October 25, 2014 by Helen Deffenbacher.